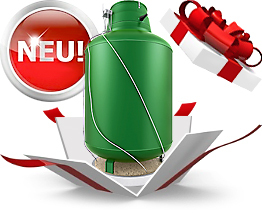 Gas tanks with 1000 and 1650 L volumes: Already on sale! Home>News>Sale of tanks with 1000 and 1650 L volumes has started. The volume of gas tank plays a very important role. A tank of required capacity is chosen considering supposed intensity of gas consumption. Frequently we place a priority on tanks with cascade connection what allows to «assemble» required volume from several gas tanks. Italian Company «Antonio Merloni Cylinders Ghergo Group S.p.A.» expands his product line! Now you can buy gas tanks with 1000 and 1650 L capacity – these tanks are already available in stock in Moscow! This makes your choice of tanks for independent gas supply much easier and helps to solve a problem in regions, where there is a problem of expensive and invalid gas tank use with big volumes exists. «Need saves us from a difficulty of the choice», - Luc Vauvenargues wrote but Italian Corporate makes our choice easy and pleasant. Increased range of volumes is a response to the preferences and demand of the clients, which simplifies a choice of appropriate gas tanks volume.